​Baptism is a response to God's love - a desire and a commitment to respond to God's call to follow the example of Jesus Christ. It is also a celebration, a time to come together with family and friends; remembering that you are loved by God, are part of a wider community and have a place with God's people. In Baptism, God draws people into relationship with God and into the family of the Church where we encounter and share God’s love. Baptism is a ‘sacrament’, a visible sign of God’s love. ​Have you thought about being baptised, and were not sure how or when? ​Would you like to join us on a baptism journey? Or to re-affirm your baptism? Or bring your child for baptism? ​We'd enjoy sharing this experience of faith with you. 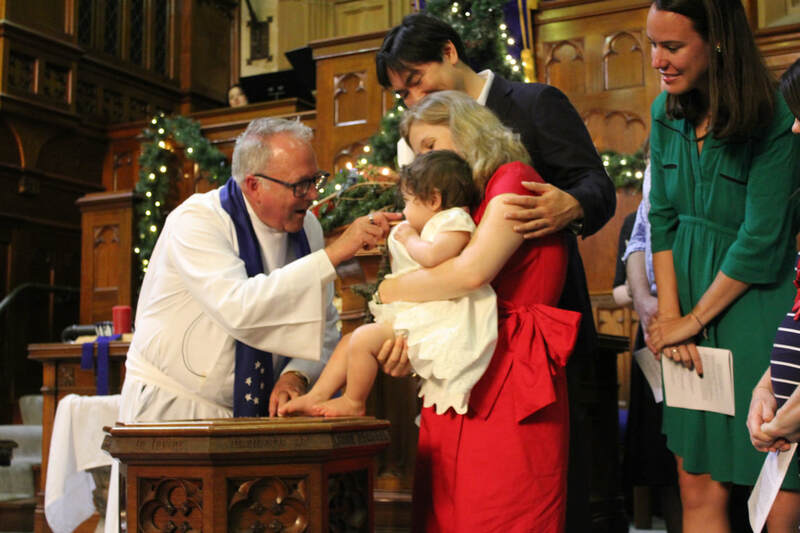 In bringing your child to baptism, some of the things that you, as parents, are doing include: joining your child to the Church Universal, both the local church and worldwide Christian family; deciding to start your child on the journey of faith in Jesus; and receiving the support, prayers, and companionship of the Church. ​When you bring your child for baptism, you will be asked to declare publicly on behalf of your child that you believe in God and that you will bring your child up to follow Jesus. Baptism normally occurs during a service of worship. On some occasions the parents prefer to have a service of thanksgiving for their child, rather than a baptism. In the service of thanksgiving, which normally takes place in the midst of a worship service, prayers of thanksgiving are said and the child is anointed with oil. Parents are not asked to make any vows in this service. If you are mature enough to make your own decisions and you've decided you'd like to be baptised, you'll have a baptism service that is designed for adults. You may have been going to church for a while and want to make a more definite commitment in terms of your Christian faith and being a disciple of Jesus. ​The baptism service is similar to the service for a child's baptism, except that because you make the decision and the promises yourself, there is no role required for parents (who make decisions and promises on behalf of a child). At the point you are baptised, you may be either fully immersed in water, or, you may simply have water poured or wiped on your head. The Minister will discuss this with you, and all other aspects of the Sacrament. When a person has been baptised as an infant, and that person now want to confirm publicly that they have become a follower of Jesus, we celebrate confirmation of faith. The Uniting Church can help you make this confirmation. Have a discussion with our minister, Ken, and he can guide you in a way forward. Some people experience a renewal of their faith and would like to mark this. The Uniting Church can help you celebrate this. Have a discussion with our minister, Ken. To find out more about any of the above within the Uniting Church, or if would like to be baptised, re-affirm your baptism, make public confirmation, or any celebration of faith, please contact us.